Enjoy the rich history of Camp Hale where the 10th Mountain Army Division trained, views of four different mountain ranges, and the Continental Divide on one of our guided ATV tours. Just 15 miles from Vail, our terrain offers glimpses of true Colorado backcountry. Never ridden an ATV before? Not to worry – no previous riding experience is necessary. Our professional ATV guides will give you all of the proper safety instruction and operation lessons you will need and then you’re on your way! ATVs, Four Wheelers, Quads – they all mean the same thing..FUN! Bring your camera, because on a clear day you can see the two highest peaks in Colorado, Mt. Elbert and Mt. Massive. All guided ATV tours last two hours on the trail. The morning and midday ATV tours include lunch at McAllister’s Grill, in our scenic lodge, at Camp Hale. Choose a made-to-order lunch from our menu and enjoy it in the Lodge or on the deck surrounded by majestic mountain peaks. 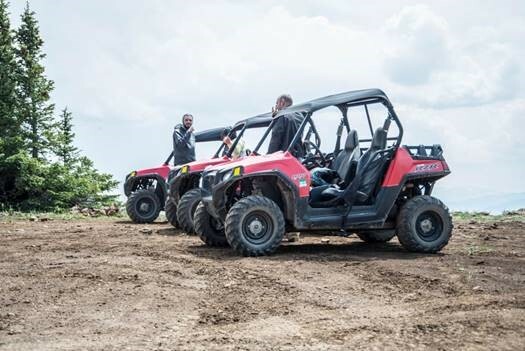 Enjoy the latest in Side-By-Side off road technology with our new Can-Am BRP 2 & 4 seaters. Experience sharp performance with the ultimate combination of power, suspension and agility. Enjoy 55,000 acres of permitted terrain in the White River National Forest. Tours start at 9,200 feet and reach elevations up to 12,000 feet. Let our guides take you through endless miles of aspens and high alpine terrain, while being surrounded by 4 distinct mountain ranges. Our morning tour includes hot, made to order lunch from McAllister’s Grill restaurant. Be sure to bring your camera! All guided tours include helmets, goggles, and rain gear (if necessary). Must be 16 years or older to drive when accompanied by an adult. Children 5 years & older can ride as a passenger. 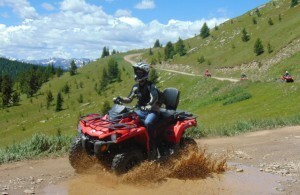 We’ll give you a safety orientation, operating instructions, and you can explore the ATV trails on your own! Our Polaris Sportsman ATV rentals are priced by the hour and we will make sure you’re equipped with a map of the ATV trail and all you need to know before you head out. Enjoy over 100 miles of trail system in the White River National Forest. Call our office to book times not offered below.